vi+343 p., cloth, 810 g.
This article re-examines the commonly-accepted theory that emphatic sentences in Earlier Egyptian are signaled by dedicated verb forms. It argues that such sentences are determined solely by context, and that the language had neither nominal nor relative forms of the sDm.f and sDm.n.f. It also argues that nominal and relative uses of the sDm.f and sDm.n.f are a feature of syntax rather than inflection. Ancient and modern explanations of the structure, vocalization, and meaning of the name of Osiris are examined. The weight of evidence supports the reading js-jrj, meaning “engendering (male) principle,” vocalized *usúri. Isis’s cognate name, *úsit, means “female principle. This paper evaluates how Champollion made use of Horapollo’s Hieroglyphika in his successful decipherment of the Egyptian hieroglyphs. The use of Horapollo by a few pre-decipherment Egyptologists (Kircher, Warburton, and Zoëga) is summarily dealt with. It has long been suspected that Middle Egyptian cardinal numerals are positioned after the noun due to orthographic convention. In this short article, I present novel support for this idea by comparing the word order of noun phrases in Middle Egyptian to typological universals of noun phrase word order. If the numerals were in fact spoken where they are written, then Middle Egyptian would have a word order that is virtually unattested cross-linguistically. 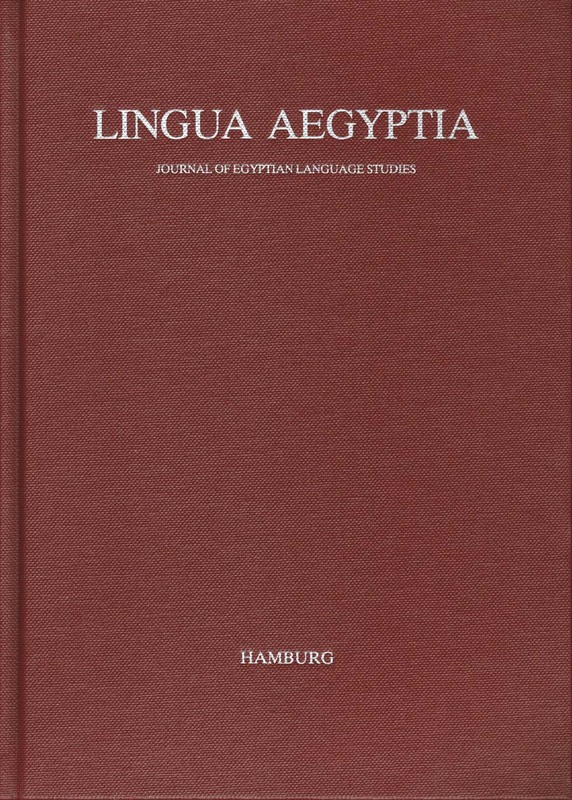 Conducted within the framework of Liège University’s Ramses Project and completed in October 2011, my doctoral dissertation centers on the nominal phrase in Late Egyptian. This paper presents the results of my previous study on gender change as well as lexeme fluctuation during the New Kingdom. Considering several changes in both form and meaning, I offer several hypotheses to explain such variation. The verb swn „to know“ of Later Egyptian has often been compared to Berber √ssn „to know“. I argue, first, that there is evidence internal to Berber that √ssn derives from √*swn of earlier forms of Berber, which makes the etymology even more convincing, and, second, that the relationship does not pertain to the Afro-Asiatic level but that the verb is a borrowing from Berber into Egyptian. The Demotic Second Tense with conditional meaning is considered by Simpson and others as deriving from the Middle Egyptian Balanced Sentence, although Late Egyptian examples are apparently missing. Recently Grossman observed three possible examples of this paradigm in the Story of Wenamun. The present article provides further examples from still older texts which could serve as potential missing links, and which put the examples from Wenamun in a broader Late Egyptian context. In her 1994 article entitled ‘Idiolects in the Late Ramesside Letters’, Deborah Sweeney hypothesises that all choices made in the construction of personal letters are reflective of individual language variance. Such a statement places the motivation and construction of letters onto the individual, and, although Sweeney did, to a certain extent, further develop her views on politeness in her 2001 mono¬graph, the idea that politeness is representative of individual language variance has not directly been addressed. This study will demonstrate that the Late Ramesside Letters reflect embedded linguistic mechanisms in order to ensure successful communication between interlocutors that is not dependent on personal language variance. The superior social position of the General Piankh at the end of the Twentieth Dynasty will be utilised to demonstrate the benefits of politeness theory in identifying lin¬guistic patterns in the letters, patterns that support and maintain social relationships between superiors and their subordinates. Politeness theory is based on the notion of ‘face’, and how an individual’s public persona must be adhered to in communication in order to reduce the level of imposition; this is especially significant in biased relationships. Predominately this study will focus on the relationship between Piankh and the Scribe of the Necropolis Dhutmose due to the amount of surviving documents between the pair, to view the linguistic manifestation of their superior/subordinate relationship. The verb form È@m.|n=f can be characterized as having three features: firstly, like the verb forms È@m.Xr=f and È@m.k#=f, it expresses action that is contingent on the preceding text; secondly, it denotes a preterite temporal situation; thirdly, from a pragmatic point of view, it is the tense used to convey the background information in the contouring (Reliefgebung) of a text. This third feature is the main topic of the present study, and the focus of interest is upon its usage in classical Middle Egyptian narrative texts. Its usage in medical texts is also briefly considered. Finally, in an appendix, the existence of an initial preterite (non-negated) È@m=f is questioned. The article is introduced by a review of the earlier literature on the subject. The often revived conjecture, first postulated by Erman, that the choice of the verb form È@m.|n=f depends on the social status of the actor, proves to be untenable, as does the explanation that the frequent use of the form particularly with the verb @³ “to speak” is a peculiarity of this verb. Despite its direct access to a significant proportion of the earliest historical development of cognition – in the sense of the expression of perception in image and language – the scientific project of Egyptology is one of the most neglected fields of the humanities. This is regrettable at a time when interest in the origins of cognition are attracting increasing attention yet accompanied by cost-cutting budget measures. Developing and applying theory to our material – and presenting this to a broader scholarly public – is an absolute priority, but paying close attention to the choice and application of theory is as important as being attentive to its potential. We should neither overestimate the power of our theories nor underestimate the potential of our material. As one of the very minor subjects even at those univer¬sities where it is present, Egyptology must cultivate its scientific potential. This undeserved neglect of Egyptology is our own fault.